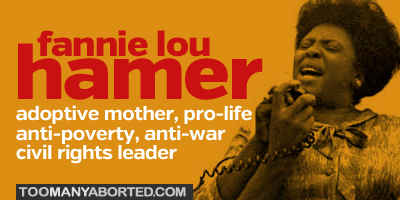 Hamer dedicated her life to the fight for civil rights, working for the Student Nonviolent Coordinating Committee (SNCC). This organization was comprised mostly of African American students who engaged in acts of civil disobedience to fight racial segregation and injustice in the South. These acts often were met with violent responses by angry whites. During the course of her activist career, Hamer was threatened, arrested, beaten, and shot at. But none of these things ever deterred her from her work. In 1964, Hamer helped found the Mississippi Freedom Democratic Party, which was established in opposition to her state’s all-white delegation to that year’s Democratic convention. She brought the civil rights struggle in Mississippi to the attention of the entire nation during a televised session at the convention. The next year, Hamer ran for Congress in Mississippi, but she was unsuccessful in her bid. Along with her political activism, Hamer worked to help the poor and families in need in her Mississippi community. She also set up organizations to increase business opportunities for minorities and to provide childcare and other family services. Hamer died of cancer on March 14, 1977, in Mound Bayou, Mississippi.